Integration Reason is no island for music making. your studio when you feel the need. Reason will easily integrate with the rest of your music gear. Use your favorite VST plugins in the Reason Rack and unlock a new level of creative options. The plugins are right at home in the Reason rack. Drag & Drop from Reason’s browser, use CV with your plugins, add Players, put them in Combinators with Reason’s own devices or Rack Extensions – all the things you expect when working in Reason! 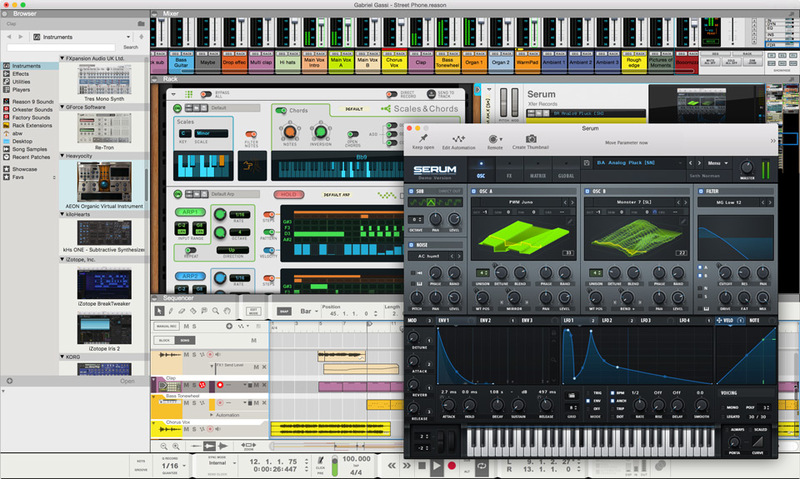 Xfer Records, FXpansion, GForce, Heavyocity, kiloHearts, Izotope and Korg plugins displayed in Reason screenshot images are each sold separately. Reason is the first third party DAW to add support for Ableton’s Link technology. Reason users can effortlessly sync their music making apps across WiFi, and Link will keep all apps in tempo and time. Drop in or out of the Link at any time. Change tempo on one device and all the Linked apps follow suit. Use the Link enabled Reason for Jam sessions with friends using Ableton Live or other Link enabled apps on desktop or mobile. Or use Link to record the sound of your favorite iOS apps to your Reason tracks in perfect sync. With REX loops you turn concrete-rigid loops into musical modeling clay, letting you change tempo, pitch and timing independently, and remodel the groove to suit all your musical purposes. Reason ships with more than 900 REX loops in its huge sound bank, but if you want more, there are plenty of companies offering ReFills with the style-specific REX loops you might be looking for. Reason does a good job at slicing up loops on its own, but if you want to take it one step further: create your own REX loops with ReCycle - the perfect tool for sampled grooves. The REX format is supported in all major music production applications. If you want to use Reason alongside other music software, use ReWire. Supported by all major music production software proudcts, ReWire takes care of synchronization and audio streaming, letting all ReWired software play together as one. With ReWire, you can use Reason as a virtual instrument rack with ProTools, Cubase, Logic or whatever application you use. The Remote technology in Reason takes the pain out of setting up hardware controllers with your music software. There are many advanced control surfaces available on the market, and Reason features support for most of them. With Remote, Reason can auto detect what control surface is connected up and assign it as the master keyboard. Reason comes with a control mapping for every supported controller that makes tweaking sounds in Reason a very pleasant hands-on experience with full support for motorized faders and parameter displays.